Forward: Gabriella Mittelman and I met when Ray Merriman suggested Gabriella’s article would be a good example of financial astrology research for the ISAR journal. Over the past two years I have been fortunate to be on staff in Ray Merriman’s Market Timing Academy and I have grown to appreciate the deep connection between markets and astrology and the importance of astrology research in all areas. Astrology research is a complex task seeking to find repeatable connections between heaven and earth. Here lies empirical research, both quantitative and qualitative. Researching financial astrology is not an easy endeavor. First, one has to be fluent in the language and culture of markets. Market research involves working with a labyrinth of technical details; terms and definitions, historical data on the market being studied, types and lengths of market cycles, and a huge amount of technical and data information on every market. There may are hundreds or even thousands of market investing strategies and approaches. Market research hopes to forecast trends, prices and timing to maximize financial investments. Once you have become intimately knowledgeable, you need to apply your many years of astrology experience. Astrological research hopes to analyze people and events, trends, and timing to maximize our ability to work with our clients, their concerns and offer sound and accurate consultations. Of course, astrology research means something different for every astrologer. In Gabriella’s article, market and astrology research form a type of financial astrology that pursues connecting planetary cycles with market cycles to understand more fully and accurately the patterns of a market and to develop an investment strategy (forecasting possible future timed opportunities to buy or sell shares with maximum profit). In this following article, I will try to show you how I analyze the move of the Euro/Dollar based on the planetary moves, different cycles and technical tools that are used in the market analysis. I will also provide some calculations I have used. Being an astrologer since 1980, I found this extraordinary branch of it that is called “Financial Astrology” while I was studying technical analysis of shares. During one of the lessons the teacher mentioned William Gann and how he used astrology to predict the markets back in 1850’s… I am self-taught and since that course in 2000, I started to search and read everything that was related to Gann and astrology. Today it is much easier, to find all this stuff on the net. You may also visit my daily blog or take my course on the subject>>. What I would like to share with you are my findings about the Dollar and some planetary cycles. When I made the graph of the dollar, it occurred to me that the Dollar made a double bottom within an interval of 779 days. A “double bottom” is a charting pattern used in technical analysis. It describes the drop of a market (or index), a rebound, then another drop to the same (or similar) level as the original drop, and finally another rebound. Every number that pops out is “suspicious.” So searching what this number means (779 days), I found that it is exactly Mars’ synodic cycle. A synodic cycle is the number of days for a planet to return to the starting point. Since Mars’ retrograde period is very long, its cycle is the longest. When I checked the number of days that passed between the two lows, I found that it is exactly the Mars cycle! (Market cycles are typically measured in time between a low (trough) to the next low or from a high (crest) to the next high. Next cycle points to September 10, 2014, a date which I got also using the former tops (crests) difference multiplied by 2.33. This picture (graph 1) shows the graph of the Euro to the Dollar, since 2009. Notice the interval that is between the two lows. Projected forward we get September, 2014. Today there are great soft wares that make life easier. The one I use, is Timing Solution. With this software one can find anything. Since I found that the Mars cycle is relevant to the Dollar’s move, I used the Mars cycle to see where it is culminating or falling. Follow the red line (or lighter line in the black and white image.) It shows tops and bottoms. Next top it falls in September…. But, we must remember as we do in a natal chart reading, we will not rely on one planet solely. In this case also we must make a synthesis between the other planets and positions, and because it is money we are talking about, it is very important. No one likes to lose… Do you? We should always question everything. The cycle does show a rise to September, but will it? The next step to check where was Mars during those tops? And we find, that it was in Scorpio, Aries, Leo/ either a sign it rules, or in a fire sign. 2) Graph C: is the same like graph A’ just colored as Mars walks though the signs. Will the pair culminate again when Mars will be in Scorpio and in Sagittarius? Like it did in 2010? You can see the colored (or light lines in the black and white) section above the date, showing the position of Mars. The question is will the Dollar rally or fall? In the Sun-Mars synodic cycle, 779.94 days - this article is based on this number and is the key component in this research. 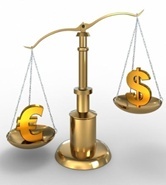 See how the Euro rallied when they were in a waxing position. Now, they are in a waning position, the arrow points where we are now- relative to the cycle- is 180 degrees; so a fall is expected - in spite of Mars being in Libra as it was in 2009 when Mars was in a waxing position to the Sun. Now we are at the exact position as we were in March 30, 2012. Next picture shows the Mars cycle- in red (or light lines in black and white). The black arrow point to where we are now- the time of writing this article – May 2014- We can see that we are price wise exactly where we were in 2012. The red Mars lines (or light lines) give us support and resistance levels. Support is a price level where a downtrend can be expected to pause, due to a concentration of demand. As the price of a security drops, demand for the shares increases, thus forming the support line. Resistance zones arise due to a sell-off when prices increase. Understanding this key concept can improve your short-term investing strategy. For example a bullish or bearish movement can be determined when support or resistance lines are broken and may affect how one acts in their investment strategy. Next step is to check the natal chart of the Euro: Here we will find that the Moon and Venus were at 24-25 degrees. Therefore whenever a transit planet will trigger them, the Euro will react. July 6,2010 : the rally starts, Mars in Virgo-Libra-Scorpio- culminating on Nov. 4,2010- with Mars in Sag. Falling for 67 days- till Mars in 25 CAP. Jan 10-2011 until May 4 is a rally until Mars in 25 Aries. This is a rally of 114 days. (114 divided by 67 = 1.70 which is a Fibonacci number). Fibonacci numbers are a sequence of numbers where each successive number is the sum of the two previous numbers. For example: 1, 1, 2, 3, 5, 8, 13, 21, 34, 55, 89, 144, etc. These numbers possess a number of interrelationships, such as the fact that any given number is approximately 1.618 times the preceding number. Why is the 25 degrees returning? In the first trade chart Venus is at 25 Capricorn! Always, when a transit planet will be at 25 degrees, it will trigger Venus, and cause a turn in trend. Age wise the Euro is 15.37 years old- calculating the Huber point of age, it is squaring natal Mars! Also the solar eclipse of May, 2014 (8 Taurus) made a 150 angle to natal Pluto. This marks the beginning of the decline from the top of 1.3992 on May 8. Back to TS: using Mars planetary lines: in red or light: the support is at 1.3596. falling from there: next step will be: 1.3370-1.2660. Updated chart: Graph d ended when I wrote the article, in May… so where is Mars … Graph E: see how the dollar fell? From Mars 9 Libra to the yellow arrow. Added on July 2 . Since nowadays the robots trade and they “know” all … The question is: will the robots let Mars do its job? The market is robotized. Meaning that people programmed machines with all the knowledge there is: math, technical tools, Fibonacci numbers, everything “they “think affects the trades, and actually robots trade. Forget about a group of people standing with small papers in their hands and shouting buy buy or sell sell… it is a Hollywood fiction. Robots are now in power, which are there mostly to wipe out the naïve trader. Specially they are trained to take your stop losses.- Oh, but I am complicating it now.. Maybe in the next article… What we should do with the help of the astrology, is to see in advance what are the planets telling us, do all the synthesis among all the planets, the path of the Moon, etc etc… and trade by them, with them. This is something robots , I believe, still did not figure out yet. Gabriella Mittelman is participant of Market Timing Digest. Disclaimer and Nondisclosure: This article is for informational purposes only. Gabriella Mittelman is not a licensed broker, and is not rendering any trading advice. Past forecasting accuracy is not indicative of future forecasting results or trading profits. This article contains information and trade secrets based on the research of Gabriella Mittelman using numerology, astrology, Gann etc. The purpose of this article is to inform and report, not to mislead. It is for the readers own personal education. Although my astrological methods have proved to have a high degree of reliability in the past, there cannot be, and you know there is no guarantee that these methods will continue to work in the future. Therefore, you are responsible for your own activities in the stock or commodity markets. Any such activity is solely your own responsibility if you choose to be active in the markets and you realize that trading involves high risk of loss of capital.